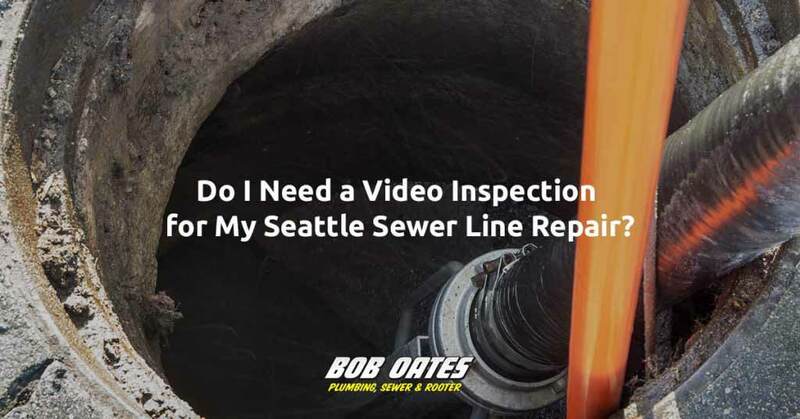 Do I Need a Video Inspection for My Seattle Sewer Line Repair? Seattle homeowners are responsible for sewer repair for the entire length of the side sewer to wear it joins the main sewer line beyond their property line. Repairs to side sewers are guaranteed to be costly, but the quickest, least expensive, and safest way to determine what repairs (if any) are needed in Seattle is with a video sewer inspection. Do You Need a Video Sewer Inspection? Short answer: probably. But it also depends significantly on the age of your house and the neighborhood. If your house and neighborhood were both constructed in the last 20 years, it isn’t time for a video sewer inspection until that 20 year mark rolls around. However, if you’ve experienced sewage backup or drainage issues or have noticed a sewage leak on or near your property, you should schedule a video sewer inspection ASAP. After that 20 year mark we mentioned above, it’s best to have a video sewer inspection in Seattle at least every two years. However, if your inspection reveals poor soil stability or particularly invasive roots, it may be wise to schedule more regular inspections. Traditional, outdated inspection requires invasive, costly and time-consuming trenching: the entire length of sewer pipe is dug up and daylighted. Video sewer inspection, on the other had, uses a small, non-invasive camera to inspect sewer lines from the inside. Video sewer inspection also allows property owners to quickly and easily watch the inspection and understand the issue at hand. We tend to think any opportunity you have to avoid digging up your sidewalk, patio, garden, or lawn should be taken! Why Sewer Video Inspection in Seattle? Seattle is positively chock full of rain and trees with powerful, far-reaching root systems. Seattle’s perennial rainfall makes the soil here particularly unstable. When too much water sits in one area of the ground it can cause the ground to move or form a sinkhole. While that causes loads of other problems, it can also cause sewer lines to shift, opening joints or fracturing lines completely. It also makes trenching dangerous. Last year a worker died during a side sewer repair when the trench they were in collapsed. Video inspection forgoes that potentially unnecessary risk. Roots also threaten sewer lines. All those massive evergreens have huge, powerful roots that can push sewer lines out of position or work their way into joints, actually growing into and rupturing the line. It’s not the case in most cities, but in Seattle, properties are constructed with side sewers that extend beyond the property line to connect with main sewer lines. Seattle homeowners are responsible for the entire length of side sewer, which means that for repairs or trench inspections, homeowners have to excavate city street and sidewalk, which greatly increase the cost and mess they have to contend with. Seattle Sewer Line Repair can’t be avoided, but unnecessarily costly inspections can be. If you think your property is in need of a sewer repair or is due for inspection, call the experts at Bob Oates Plumbing, Sewer & Rooter.